Farmhouse style has become increasingly popular in homes far from the countryside. The sleek and cozy spaces are taking Pinterest and Instagram by storm, making people around the country sit up and take notice—and we aren’t just talking about a shiplap infusion. Signature elements of the aesthetic, like distressed elements and neutral colors, are easy to incorporate in any home. The pros? This low-maintenance style allows you to mix and match colors and textures to create a setting that is both chic and comfortable. Exposed timber beams, simple monochromatic color schemes and natural elements like green plants and unfinished wood are all features of Farmhouse style. 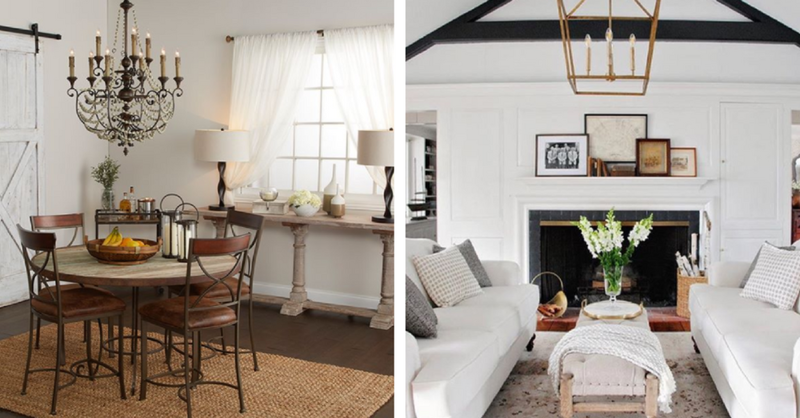 Because the aesthetic focuses on simplicity, you can add your own interpretation of Farmhouse touches to any room in your house and still maintain a stylish, curated look. And the best thing about Farmhouse style is that it’s relaxed and lenient, meaning you have the flexibility to combine a lot of different finishes to create a super comfortable living space. Monochromatic fabrics with varying textures are great for Farmhouse style. When looking for Farmhouse-inspired fabrics, focus on breezy, lightweight fabrics instead of heavier, more traditional weaves. Cotton or muslin, come to mind immediately and can be used for window treatments, table runners, floor coverings and even some upholstery. Like other elements of the style, Farmhouse fabrics are generally quite simple. Look for ticking textiles, subtle, upgraded gingham and woven throws to make your room look country-chic. Don’t overlook the effect smaller accent pieces can have on the overall look of your space. From statement pieces like tables and light fixtures to nature-inspired tableware, there are plenty of options to tie the room together. In fact, don’t overthink it—when it comes to Farmhouse style, almost anything goes. This rustic yet classy dining table is sure to turn heads, especially when paired with neutral chairs. The distressed gray wood makes it the perfect statement piece for a Farmhouse-style dining space. Consider a sideboard like this in your home for a simple, yet rustic Farmhouse look. The wood works perfectly with neutral homes, while the twigs and succulents bring the outdoors in. Open shelving is a great way to make Farmhouse style more modern. Both the nature-inspired wood artwork and the pops of greenery make this accent piece distinctly organic with a Farmhouse feel. Like all styles, Farmhouse exists on a spectrum, meaning that you can interpret it as you please and decorate your home to match. If you like what you see, but aren’t completely sure how to make it match your home, contact us for a consultation.